What did you find? Bleach, Ka-Boom, The Works, Lysol, Comet, Pledge, Pine Sol? The ever-expanding arsenal of home cleaning products includes several dangerous weapons, loaded with strong, artificial colors and fragrances and harsh cleansing agents like bleach, ammonia and acids. Did you know that if you use two cleaning products in the same small space- i.e. your bathroom- you might just kill yourself? That’s right… using a common bathroom cleaning product like bleach tile spray in conjunction with a glass cleaner can cause a very dangerous gas to form. DO NOT DO THIS! 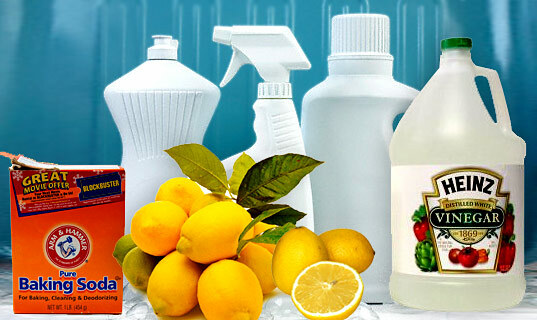 All of these chemical cleaning products produce indoor air pollution by producing toxic fumes that can irritate eyes and lungs. 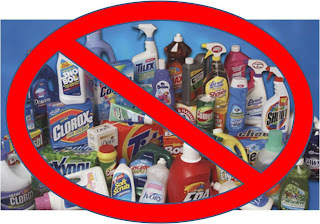 (Children and pets are most at risk) Many cleaners also contain unnecessary antibacterial agents (pesticides, technically), that can actually make bacteria stronger, and more resistant to antibacterial drugs. Not to mention, commercial cleansers cost a lot! So save your health and your wallet: make your own! Even the biggest messes and toughest stains can be attacked effectively with simple ingredients that are already in your home! 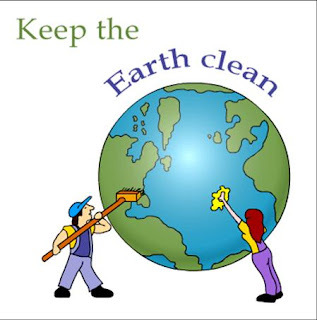 Disinfectant: Instead of bleach, make your own disinfectant by mixing 2 cups of water, 3 tablespoons of liquid soap and 20 to 30 drops of tea tree oil. It's easy! Club Soda: You've probably heard the old adage that club soda works well on carpet stains. But you have to attack the mess right away. Lift off any solids, then liberally pour on club soda. Blot with an old rag. The soda's carbonation brings the spill to the surface, and the salts in the soda thwart staining. Hardwood floors are easy to vacuum, but don't do well with wet mopping. So how do you restore their natural glow without roughing them up? Conventional oven cleaning chemicals are loaded with toxic ingredients that are harmful to skin and eyes, and the fumes are unhealthy. Instead, go natural! A clogged sink is a real hassle, but pouring toxic chemicals like Drano down it isn't so wise. Not only will it pollute our waterways, but the products can cause chemical burns and are highly dangerous if ingested. Do you really want that in your home? Baking Soda and Boiling Water: Pour 1/2 cup of baking soda into the problem drain, followed by 2 cups of boiling water. If that isn't doing it for you, chase the baking soda with a 1/2 cup of vinegar and cover tightly, allowing the vigorous fizzing of the chemical reaction to break up the gunk. Then flush that with one gallon of boiling water. Whether you have fine family heirloom pieces or something you picked up at an estate sale, you're eventually going to have to wash them. Even with advanced settings on today's washing machines, you still may want to address fragile fabrics by hand. Sunlight: What could be easier than sanitizing and removing stains... with sunlight! (Just don't do it too often with fragile pieces, because they can start to break down). Simply lay your old lace, curtains and other fine linens on the grass in the sun for a few hours. Dirtier pieces can be dampened first. Boiling: If that doesn't do the trick, fill a pot with water and bring to a boil on your stovetop. Drop in linens and let steep until stains lift. Commercial silver polish contains toxins, and manufacturers recommend you don't leave on skin too long. Do you really want something like that spread over the utensil you use to put food in your mouth!? Toothpaste: If you can't immerse your items or are otherwise inclined to polish by hand, rub tarnished silver with toothpaste and a soft cloth. Rinse with warm water and dry. Instead of toothpaste you can substitute a concoction made of 3 parts baking soda to 1 part water. Soap: Wash your pewter items in warm soapy water, rinse, and polish with a clean cotton cloth. Instant clean! Steel Wool and clean cloth: Wipe down the item with the cloth, scrub lightly with the steel wool, rinse and then dry. Be sure to rub in a little vegetable oil once it is dry to inhibit any further rusting. Lemon Juice and Baking Soda: combine a few tablespoons of lemon juice and 1 tablespoon of baking soda, rub it on and then polish it off…so shiny! If your items are heavily soiled, you can soak them in hot vinegar and some table salt. The shine will start showing up on its own, and once you see it, take the item out and rinse it. You can also rub lemon on brass to get into any grooves that need cleaning…just be sure to wipe it off once it is clean.